When I began writing my memoir, Paddle for a Purpose, I felt a need to immerse myself in the world of memoirs, in order to more fully understand the genre. I read Wild, by Cheryl Strayed, Dirty Shirt, by Jim Landwehr, and – Packers fan that I am – The LeRoy Butler Story: from Wheelchair to the Lambeau Leap, among others. I also joined the Facebook Group, We Love Memoirs. They billed themselves as “The Friendliest Group on Facebook.” Why not check it out? I thought. We Love Memoirs has a strict policy against self-promotion, which didn’t matter to me – I didn’t have anything to self-promote. I did, however, get acclimated to the group, which was rather small at the time, but had members from all over the world. I participated in the conversation threads, contests, and sometimes quirky games. The conversations were not just about reading, but also about the people’s lives in the places where they lived. I met people (authors and not) from all over, including Europe, Australia, South America, Canada, and various states here at home. This group lived up their self-appointed moniker. I even saw posts of WLM members meeting up with each other as they traveled to other places around the world! Before long, I noticed that the admins promoted many books by member authors – when they were newly-released, or if they were free or on sale. And, once in a while, special party days gave authors a chance to talk about their own work. But the rule against self-promotion (and Clarissa the Crocodile, who gulped down offending posts) kept things from getting out of hand. I soon discovered a companion group as well, We Love Memoirs Authors Group, which offered writing and marketing advice with a side order of well-earned wisdom. I turned to them occasionally with questions, and found them eager to share advice with a newbie like me. 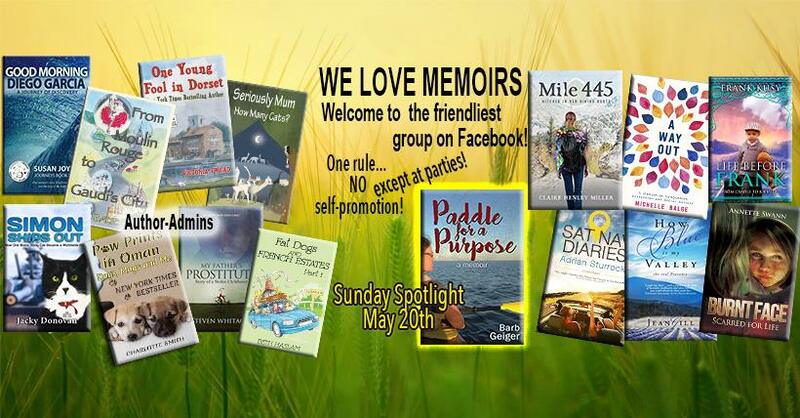 On most Sundays, WLM highlights one author with a Sunday Spotlight. At any time during the day, members can ask questions of the Spotlight author – not just about their book, but about anything. I met some awesome authors this way – by popping in and asking some questions about their books and their lives. Nowadays, an author is expected to help “market” their book -which basically means to put yourself out there. A publisher can help with ideas, visibility and encouragement, but the book launch, readings, signings, appearances, and the use of social media are expectations if you want the book to do well. After an amazing book launch with wonderful friends from all areas of our lives there to share the excitement, Gene and I have been enjoying appearances and loving the creative pictures you’ve shared of yourselves reading the book. But, we’re finding that marketing can also be old-fashioned, time-consuming hard work.